Moved by revolutionary political and social upheavals, a harsh civil war and the struggle to build a new, non-capitalist society, artists, architects, designers and other creative workers sought to make new forms in an effort to shape a better society. Corinna Lotz reviews Building the Revolution. Artists such as Kazimir Malevich, founder of Suprematism, who pioneered abstract painting before the revolution of 1917, like so many others, was energised by the overthrow of the 1% who had ruled Russia. He and his fellow painters and designers sought to create a new artistic language which aimed at touching and transforming daily life. They had material support and encouragement from the new ministry of culture and enlightenment, headed by Anatoly Lunacharsky. Much of the brilliance, excitement and – eventually – the fate of the movement is unravelled in this complex and often challenging exhibition, which moves backwards and forwards in time. Originating from two separate collections – the artworks are from Greece and the vintage photos from Moscow – Building the Revolution brings together the conceptual-artistic side of Soviet Modernist art and design with an understanding of how this was transformed into a real built environment. Art works rescued from oblivion by the legendary collector George Costakis, who lived in the Soviet Union during the Stalin-Brezhnev period, are shown side by side with Richard Pare’s spectacular large-format images. Adding the dimension of time, Pare’s photographic campaigns over two decades show how the Modernist buildings actually look today. 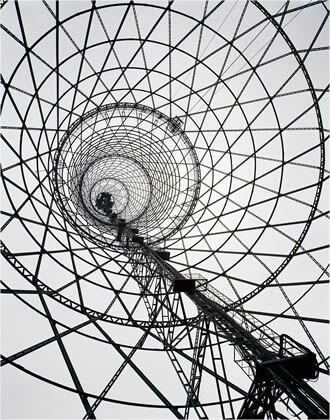 To complete the picture, his colour images are accompanied by contemporary black and white documentation from the Schusev State Architecture Museum. Factories, schools, colleges, garages, workers clubs, radio towers, offices, health spas and housing schemes were constructed in the years immediately after the 1917 revolution around all the Soviet Union. Many remained virtually unknown, their interiors unseen even by those who lived cheek by jowl with them, until the mid-1990s, when Pare overcome the challenges of geography and bureaucracy to gain access. Until the late-1980s not only the buildings, but historical archives in general were out of bounds to researchers. Mikhail Gorbachev’s perestroika and glasnost (restructuring and openness) changed all that. Thanks to that remarkable political initiative and this photographer’s life-long love affair with Soviet Modernism we can finally see what remained hidden for so many decades. Pare’s images, made with an 8" x10" large plate camera, reveal structures of beauty and conceptual daring, more often than not in a crumbling state of decay. “I want to show the buildings as they are but also to reflect the optimism with which they were conceived,” Pare says. Speaking at the opening of the London leg of a show which began as the brain child of the SMCA-Costakis museum in Thessaloniki and has travelled from Barcelona and Madrid to London, he made an impassioned appeal on behalf of the Soviet Modernist legacy. 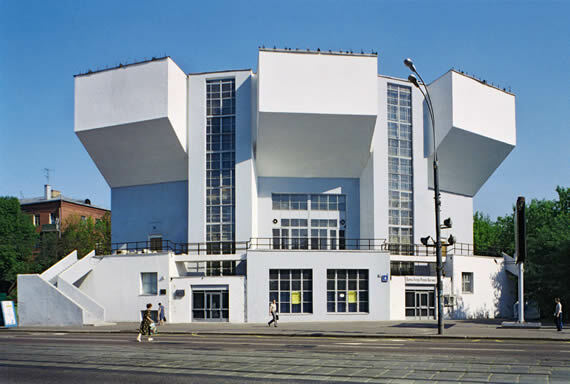 Pare believes that the architects who designed these structures were “visionaries [who] saw possibilities and, against all odds, found ways to produce... canonic buildings that define Modernism in the early years of the Soviet regime”. The iconic buildings – far ahead of their western counterparts in the invention of prefab construction and in many other design ideas – survived the Stalin decades due to what Pare terms “malign neglect”. Shelter from the elements remained in short supply in a Soviet Union affected by wartime destruction and so they continued to be used, for housing, social and industrial purposes. But in recent years, due to uncontrolled speculative development, a catastrophe has been unfolding in Moscow, Pare says. Wanton demolition has made the city unrecognisable, with listed buildings dating from as far back as 1812 being torn down. Despite the founding of the Moscow Architecture Preservation Society and a new awareness of the achievements of Soviet Modernism, things remain extremely precarious – with many buildings “teetering on the brink of imminent destruction”. 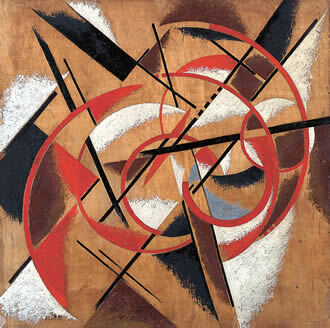 “It was very difficult at that time to find paintings by Popova. Somebody introduced me to Pavel Popov, her brother… Pavel suggested me to go to his adopted son’s house. So I went... The first thing I noticed going up the stairs to the second floor, was a Popova painting on plywood being used to support the trough where they did their laundry. They showed me many Popova’s gouaches and drawings. Suddenly, I noticed that the windows were covered by paintings by Popova on plywood. I asked them if it was possible to buy these paintings too, but they said ‘no, these ones no, it will rain and everything will get wet. Bring us another piece of plywood and then we’ll give them to you’. I went back to Moscow, I found new boards and they gave me the paintings”. But whilst portable art paintings and sculpture have travelled the world, revealing the story of the Russian and Soviet avant-garde, architecture has suffered a different fate. Only small groups of experts and aficionados have had the time and resources to seek out what was actually built. Therefore, Building the Revolution is a great follow-up to recent shows about Constructivism and the international avant-garde held at Tate Modern over the last two years. These architectural pioneers, inspired by a non-conformist, innovative and socially-aware aesthetic, helped solve workers’ housing problems by creating new ways that people could live together communally. Moisei Ginsburg’s Narkomfin complex, just to give one example, had traditional family units as well as fully-integrated communal housing. Ginsburg, who trained in Paris, because as a Jew in Tsarist Russia he had limited access to higher education, formed strong connections with international developments in architecture as he sought to formulate an approach that would be both functional and aesthetic. 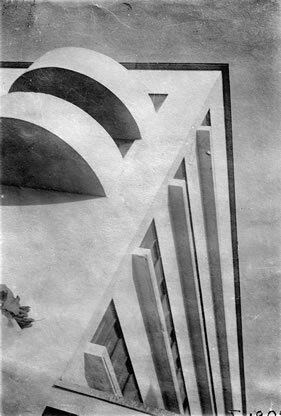 Other architects included Konstantin Melnikov, Ilia Golosov, Vladimir Shukhov, the Vesnin brothers and Ivan Leonidov, who collaborated with Ginsburg. Leonidov was subject to particularly vicious attacks as the tide turned against Modernism in the late 1920s. Historian Jean-Louis Cohen recounts how prominent Western writers and architects, including Frank Lloyd Wright, were less than supportive when cruel attacks on Constructivist architects began to rain down after 1932. The exhibition pulls no punches about the fate of the avant-garde under Stalin. Accompanying texts, biographies, educational material and political books on display emphasise that there was no automatic transition from the elegant Modernist aesthetic to the pompous monstrosities that passed for architecture in the Stalin era. No more in architecture than in politics did the counter-revolutionary approach somehow evolve from the Modernist aesthetic. There was a deep break, as the Stalinist bureaucracy decreed that all artistic production had to conform to the meretricious dogma of Socialist Realism. The diverse and conflicting strands could not be clearer than in the Moscow City Electric Power Station (MoGES) on the Moskva river, designed by Ivan Zhotlovskii, and still in operation 85 years later. On the front facing the river, the architect has applied classical principles. The inner façade, hidden from passers-by, is in stark contrast, and with its tall, projecting glass columns, it makes thrilling use of transparency. A contemporary image shows a horsedrawn cart pulling bricks. The architects had to use antiquated means to achieve their design aims, at times ahead of architects in western Europe such as Le Corbusier. MoGES is symbolic of the new regime’s struggle to leap out of backwardness which had characterised Russian development. Starting with the superb reconstruction of Tatlin’s famous tower in the Royal Academy’s courtyard and closing with a fascinating installation in the Architecture Space showing how it was done, this show gives a glimpse of the sheer daring and inventiveness of a great and historic experiment. Don’t miss it. * From a talk given by Maria Kokkori, research fellow of the Malevich Society in New Yor,k about the materials and techniques used by the Russian avant-garde artists hosted by the Institute of Conservation in London.